The Summer Spurs and Summer Blazers meet in a quarterfinal rematch. The 3-1 Summer Spurs and the 3-2 Trail Blazers meet again in a quarterfinal match of the NBA’s Las Vegas Summer League. The eighth seeded Spurs required a late, fourth quarter rally to defeat the Pelicans 86-81 while the sixteenth seeded Trail Blazers got by Toronto 91-85. The winner of this game plays the winner of the Memphis – Miami quarterfinal match on Sunday. The Spurs handled the Blazers fairly easily in the first meeting by a score of 95-85. Led by Forbes’ 35 points and double figure contributions from Hanlan, Jefferson and Whittington, the team enjoyed its best shooting night of the summer, hitting 52 percent from the field and 45 percent from three. With Caleb Swanigan (19 pts., 13 rbs.) making 8 of 14 of his field goals, Portland also shot well at 48 percent. Rip City, however, missed 10 of its 26 free throws and 12 of its 19 three-point attempts. Plus, they turned the ball over 27 times to the Spurs 20. Rebounds were even at 30. Power forward Caleb Swanigan, the 26th pick in this year’s draft, is averaging almost 15 points and 11 boards. The three other Blazers averaging in double digits are R.J. Hunter, Jake Layman, and Jarnell Stokes. 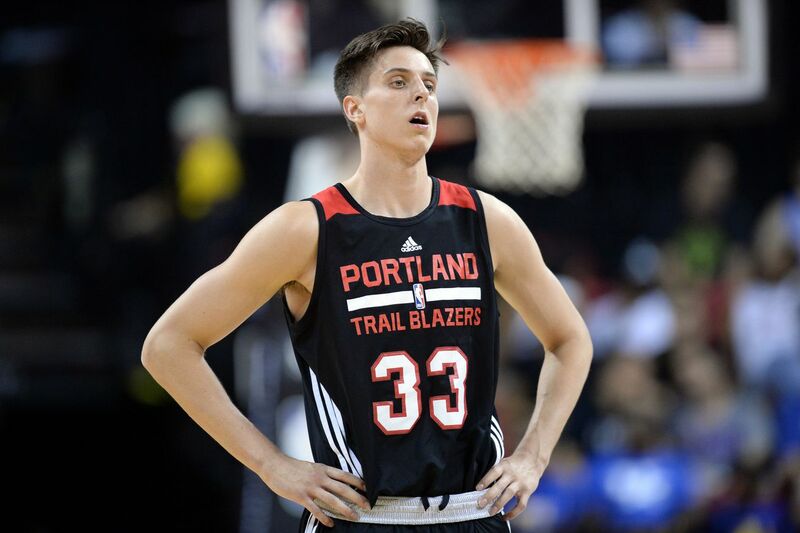 Portland has been without seven-foot center Zach Collins for both tournament games after the 10th pick in the draft injured his leg against San Antonio. Against Toronto, the Blazers played perhaps their best game so far. They overcame Fred VanVleet’s 31 by cutting down on turnovers and spreading out the scoring, including 17 by Nick Johnson. San Antonio outscored New Orleans 31-19 in the fourth quarter to win by five. Despite a sub-par shooting night, the team committed only 6 turnovers and made 14 of 16 free throws, including many during clutch time. Forbes once again led with 29 points followed by first round pick Derrick White with 15. Olivier Hanlan had a double-double with 10 points and 10 rebounds. He also led the team with 6 assists. Second round pick Jaron Blossomgame added 9 in perhaps his best offensive outing and Shayne Whittington punched in 8. Though both teams shot well, any game with 47 turnovers in 40 minutes inhibits constructive analysis beyond that obvious statistic. Since however, both teams have done better with ball security. However, pity the team that can’t hold on to the ball in the rematch. Swanigan presents a challenge for the Spurs as does Forbes for Portland. Both require help and some decent shooting. Whichever supporting cast shines brighter will propel its team into the semis. With both teams rested on Friday, I expect a better played rematch. For the Spurs, the players now understand their roles on this team. Moving forward requires robust performances from all.